Recent studies show that we absorb as many toxins through our skin as through the foods we eat. Daily cleansing, moisturising and deodorising, can mean a cocktail of hundreds of different chemicals being absorbed by the skin, directly into our bloodstream (that's how nicotine and birth-control patches work!). 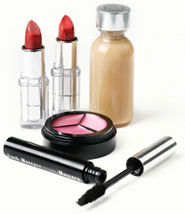 It makes as much sense to choose cosmetics made with natural and organic ingredients, as it does when choosing food. But there's a real difference between the regulations governing the labelling of food, and those for personal bodycare products. 'Natural' and 'organic' are very mis-used terms in cosmetics. Unlike food, there's no legislation governing these terms. Products labelled 'organic' can contain as little as 1% of ingredients derived from natural or organic origin. This means that products that are legitimately marketed as natural or organic, are competing with products that are being marketed on the basis of a 'natural' image - rather than actual ingredients. We've included a list of some of the most common toxic chemicals found in body care products here. If you know of others you think we should add to the list, contact us here.